What does one need for a perfect wet shaving routine day in and day out? A shaving soap and shaving razor? Check! Perfect shaving blades that cut close to one’s skin? Triple Check! Okay, you’re all set. Or, are you? Look over the counter of any wet shaving enthusiast and you’ll know that you’re missing a piece of the puzzle. What is it? Maybe it’s the thing our grandparents treasured the most. A shaving bowl. No matter how good your brush, cream, razor, and blades are… without the perfect lather, these things will always be bland. That’s where the debate of “Which is the best shaving bowl?” fits in. Believe it or not, these ancient objects are ever so relevant in modern-day grooming too. So much so that Robert Sherwood’s vintage shaving bowl was auctioned for 800 bucks! But why? What makes them relevant still to this day? How did these things originate? Which models are the frontrunners in the current world? Do we pick one at random? I’ll be nosediving in these topics in great detail. Hop onto the wagon. Shaving Bowl: When Did I Show Up? 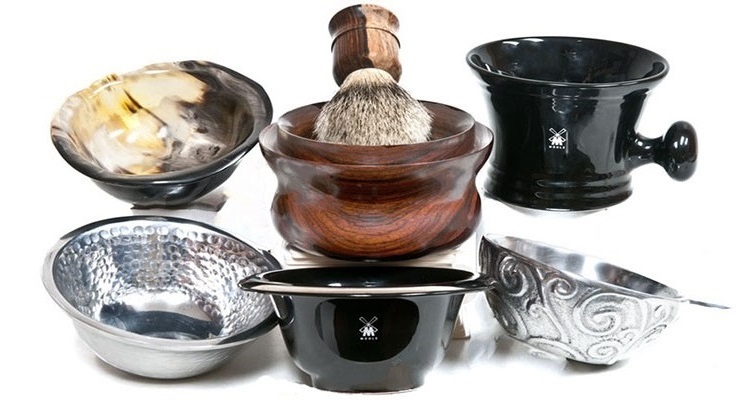 If you think shaving bowls popped up yesterday (okay, make it 100 years ago), think again. Jog your memory and set the records straight. Did you know that bowls were seen as early as during 2500 BCE? Don’t freak out. It’s true. Those bowls were out of shape. Mugs came after people invented potter wheels. Patterns emerged years later. We’re seeing scuttles, cups, and other varieties are relatively modern into the timeline. In the early days, people used clay to design these things. As days went by, we got ceramic, glass, stainless-steel, plastic and wooden containers. Let’s Discuss the Types: Are All Shaving Bowls the Same? No, they aren’t. Yet, they are. To be clear, these three things look almost the same yet, they are different in how one uses them. For example, all three of the varieties hold forth in different ways. With a bowl, you can whip the froth and then use it. The froth will gradually cool down even if the product is heat insulated. Mugs are generally used when working with pucks. You can use a handle to steadily grab them when you whip the lather. People with bigger brushes will struggle with mugs. Scuttles give you froth in quick time. One can use the handle too. The USP of scuttles is the fact that users can keep the lather warm with a hidden reservoir of hot water inside. It is refillable. Let’s be honest, there are hundreds roaming the market. Most of them are low hanging fruits with cheap quality and output. Hence, I took it upon myself to scour the earth to find seven worthy bowls that could hold our lather inside and keep it warm for use. If you just have about $20, there’s a strong chance you can grab this bowl from the market. I like the price as it goes with the subtle features we get to enjoy by purchasing this product. For starters, Stainless steel (real stainless steel) gives it a solid base. Unlike ceramic and glass, you don’t have to worry about it breaking anytime soon. This is “Heavy.” One benefit of having a heavy bowl is that it won’t tip over when you put too much warm water into it. On top of that, the makers made the construction rugged and rough. This way, people can hold the bowl into their hands and keep it still on the shaving counter. It won’t have the chance to slip up like some of the traditional luxurious brands out there. It’s simple yet functional. 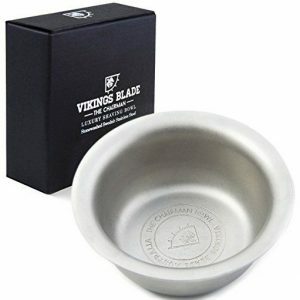 This Australian bowl shines even more due to a technology unique to VIKINGS BLADE. 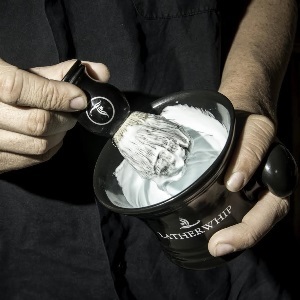 This microscopic technology is what grants The Chairman Luxury Shaving Bowl the texture and volume it boasts about. If you guys didn’t know, VIKINGS BLADE is trying to gain a patent on this and make it official. My only issue is that it is a single-wall bowl. When putting hot water in, it can burn the hand if someone is not careful enough. Other than that, the experience with VIKINGS BLADE was great. The microscopic technology allows this bowl to hold more shaving material inside than others. This bowl has a heavy bottom, it won’t tip over when filled with water to its neck and beyond. 3-inch diameter is a comfortable space to work with your shaving soap or cream and the brush. I love the rugged texture. It helps me to grip the shaving bowl without the fear of dropping it. Stainless-steel construction makes for an eye candy of a bowl on my bathroom cabinet. The single-wall bowl can warm up pretty quickly with enough hot water inside and burn the hand. Oh… this is good. Latherwhip mentioned upfront which things this little bowl is good for. Sure, this is a Ceramic bowl. And yes, these things tend to break when dropped from a considerable height. BUT I can vouch for the thickness of ceramic in this case. People needn’t worry about accidents ruining it for them. Despite things being reinforced with ceramic, you’ll find it light. I had no trouble picking this mug up or carrying it to some place. This Shaving Bowl doesn’t strain your hands. Makers included a nifty “Apothecary-Style” handle that allows for a good grip. Yes, it is aesthetically a huge boost. It also works to hold the bowl steady when one’s whipping the froth at a brisk pace. Makers raised the upper part of the bowl. This is called a 3-ridge base. 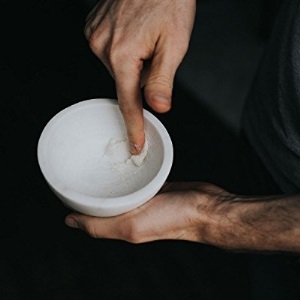 High-End shaving bowls come with these types of enhancements to make the shaving experience a bit better than usual. We have a difference in diameter from the inner part to the upper by an inch. The precise diameters are 3.5 inches (inner part) and 4.5 inches (upper part). 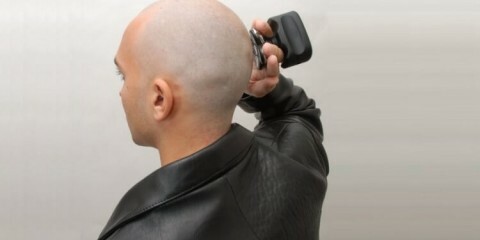 This helps us shavers as we can put in shaving soaps, pucks or creams comfortably. This little bowl is thick enough to retain heat. One can whip up some “Quality Lather” in this bowl without worrying about the water getting cold. Even if you don’t use the water right away, it still remains hot for about half an hour or so before gradually cooling off. Don’t worry about washing this thing. It is normal ceramic like so many of our household products. A normal dishwasher should clean this bowl just fine. This could be a perfect gift for someone you love or care for. Men love these elegant-looking accessories. Ceramic construction with a black sheen is every bit trendy and classy as anyone would hope for. Raised top works for me, I can increase the lather quantity without the fear of it tipping over. The “Apothecary” handle is great! You can hold the bowl while whipping soap, puck or cream. 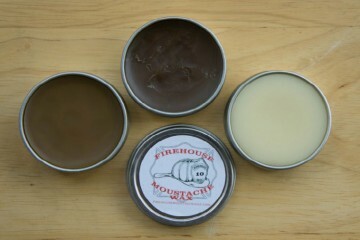 Yes, it works with a soap, your shaving cream, gel, and even a little puck. This bowl does great to retain heat. Warm water remains so for a long time when left alone. Some people may have trouble with swirling their brushes for a substantial froth because it’s not too wide. It had to be an AKStore product at number three on my list of best shaving bowl contenders. Let me clarify things. It is not so much of a shaving bowl as it is a “Shaving Cup.” If you love shiny things, you’ll love this (no pun intended). One of its qualities is having a Stainless Steel “Double Wall” construction. As we all know, double walled bowls retain heat better than the others. The guys at AKStore call it a “Heat Insulation Design.” This cup cost me less than 10 bucks. 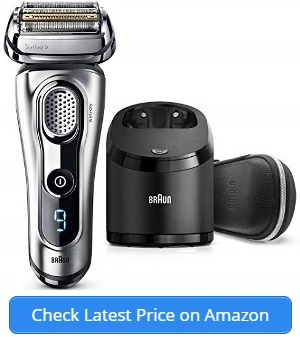 To get a shiny “Heat Retaining” piece of shaving furniture at this price is a win in my book. But AKStore doesn’t stop there. This is not just a fancy piece of silverware you’ll buy. It’s functional. For example, the inside part is polished. I touched the inside part of the cup/bowl and felt no rough spots (which is normal for low-price bowls). The upper part of it is slightly raised. This prevents the lather from spilling outward. Many of the steel-made bowls tip over when you pour too much of whipped shaving soap, cream or gel inside. Fortunately, it’s not the case with this shaving soap cup. The guys at AKStore gave it a bit of a stand at the bottom. They call it, “The Anti-Skid Design.” Thanks to this, the bowl stays steady on the counter. Did you notice I didn’t bring up the dimensions of this little product? Well, it is… small. At a height of 2.5 inches and a width of 3.3 inches, it is the smallest member on my list so far. I’m not a super fan of the dimensions. It can’t hold much of the froth we make. You’ll have a double-wall heat insulation design at a price under 10 dollars with this product. The construction overall is great as the inner part of the bowl is well-polished and scratchproof. This thing comes with a thick and polished edge. It helps to balance thee rounded object. I love the little stand-like thing at the bottom. It keeps the bowl steady and standing on the counter. 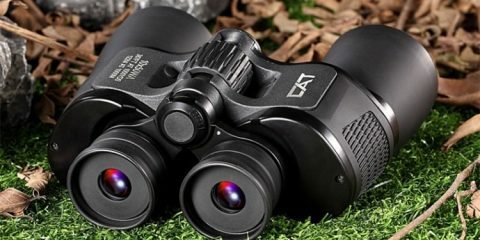 It is durable unlike what most people think. It can withstand quite a bit of punishment, wear, and tear. If anything, this thing is too small. It is a palm-size object where only a puck of shaving soap will fit. It’s a “No Brainer” that I’ll include Schöne on my list. If you are a fan of stainless-steel shaving bowls and a classy design, Schöne nails it out of the park with its product. It “One-Ups” the others with a compact lid that retains heat and keeps the inside covered as well. Thanks to the lid, you can put the soap inside the bowl, cover it, and forget about the rest. The bowl will keep the soap hydrated. One doesn’t need a separate shaving soap container. There are some brands that people feel proud to own a product of. Schöne is definitely one of them. This stainless-steel bowl is well polished from the inside out. This is original stainless steel I’m talking about. 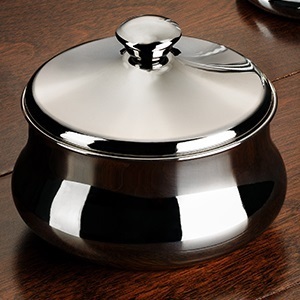 Don’t mix this with other chrome-plated bowls that “Claim to be” stainless steel. One benefit of the polish is that it’ll retain the sleekness you see. That means no disfiguring or discoloring even after one or two years of constant use. Not to mention, steel is durable and can withstand accidental drops. Don’t worry about shaving brush tips scratching the surface. I love the overall design. At the bottom, the bowl is 4 inches in diameter. The height is 3.5 inches, and the depth of it is 2.25 inches. So, what of it? Well, as you might have guessed, it is perfect for 3-inch shaving soaps. Schöne holds all your favorite products across different brands inside to perfection. One can clean this Schöne product in whichever way he or she likes. This bowl is dishwasher-friendly. Feel free to use your hand and a bit of tap water to clean this as well. Your shaving brush or the cleaning apparatus won’t be able to put one scratch on this bowl. I guarantee it. I like the design and the smoothness I get inside the bowl, you won’t find any ridges here. The lid is a thoughtful addition. It maintains good lather and keeps the soap hydrated in between uses. The bowl is durable. The polish won’t peel off or flake even after months or years of using. This thing is perfectly safe to use with dishwashers. Wash it by hand if you will. Schöne is capable to hold all the reputed shaving soap brands on the market (even the pucks). Some of my friends who used this in the past thought the metal isn’t as thick as theyd have liked. You need a bit of time to get used to opening and closing of the lid. Have less than 30 dollars to spare? Want a classy furniture that does what it claims to do? Well, click right away and buy this Marvel Shaving Bowl from Supply. Marvel retains heat better than ceramic and it looks great. So, I don’t see any reasons for people not to buy this thing. In fact, marble is 3 times better than ceramic at the job of retaining heat. The water you put in will stay warm for longer. Also, the soap will not dry out that fast. Just don’t forget to empty the bowl when you are lathering. In case of creams, take a small amount and smear it at the bottom before frothing up. Another reason I’m pushing the envelope here is the fact that this “Supply” Bowl has micro-ridges on the inside. These ridges help you to come up with creamy, foamy froth when you whip the soap or the cream or gel for that matter. These ridges come from intrinsic markings on the marble. Why so? Well, the entire bowl is handcrafted from solid marble found in mines (Oops! Forgot to mention that. Now you know). You KNOW that you’re getting a quality product just by the look and feel. In fact, it just might be the best shaving bowl people are here to find. Remember, I gave you a short lecture on marble’s heat retaining ability a minute ago? Owing to this, the lather stays creamy and usable for a longer period of time before cooling down and becoming sticky. 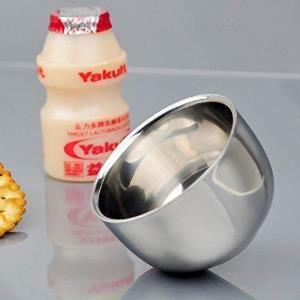 With a diameter of 4.5 inches and 2 inches in height, the bowl looks like a miniature ramen bowl from Japan. The good thing is, soaps of all sizes will fit in there. The natural ridges inside help to conjure up thick and creamy lather with a small amount of soap. At this point, I’d be repeating about the heat retaining capabilities of marble but it’s useful. The handcrafted design is great when you want to hold a large shaving soap or a small puck. With it the lather and your soap stays usable for a long period of time compared to others. As you continuously use this bowl, oils in shaving soaps will seep into the stone and damage it. People who use larger shaving brushes may find it hard to pair with them. There’s no way I was gonna leave out Edwin Jagger while speaking about Shaving Bowls. My penultimate product on the list is the porcelain bowl with a handle. Sure, it is a bit costly. Stainless steel bowls and wooden ones are cheaper than this. But it’s well worth the price you pay. Edwin Jagger is a UK brand with a rich heritage of shaving products. It comes with a legacy to uphold. The effort shows when you look at the design and unique shape of this porcelain bowl. I like the black finish. The sheen gives it an aristocrat look that pairs well with any type of shaving counter in your bathroom. The design is unique too! You have a wide top half that slowly shrinks down as we get to the middle. Finally, it widens again at the bottom. This design allows for most soaps (specifically, the larger ones) to nicely fit in. If you want, you can use pucks or small-sized soaps with this thing too. 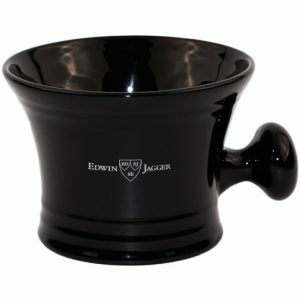 This product from Edwin Jagger has a 4-inch diameter at the top. Then it shrinks down to 2.75 inches before getting up to 3 inches at the bottom. This thing doesn’t retain heat, as well as a marble does. But it’s better than steel in many ways. The bowl doesn’t radiate heat as quick as steel does. People won’t burn their hands with it when the water is too hot to handle. The walls of Edwin Jagger Bowl is thicker than usual. A common complaint with porcelain bowls is that they are heavy and easy to break. To address this, makers have included a handle on this product. It’s more like a mug than a bowl. With this handle, one can grip this mug/bowl in such a way that it doesn’t drop when someone’s conjuring lather. It’s a product with a unique design concept that helps by holding more lather inside than others. You have a design that retains heat and keeps your froth warm for a long period. I liked the handle. It’s uniquely designed like a drawer pull. It minimizes dropping accidents. The mug is robust. Thanks to the thick wall, it can withstand shocks caused by falling from a distance. Few of the users mentioned that a tiny amount of lather gets stuck at the bottom corner of this product each time they shave. I saved the best shaving bowl for the last. To be honest, I’m playing coy with you here. It’s not actually a bowl so to speak. It’s a scuttle mug. Now, hold on! Pottery G20 is heavier (thus, more durable) than the average shaving bowls or mugs. Plus, it has a bunch of perks in its kitty bag. Let me count them for you. The first thing that impressed me is the amazing design and color. This little mug comes in “Hamada and Blue” color. No, not Walter Hamada of the Warner Brothers you silly! It’s just how the color is named. Oh, and it’s handcrafted in USA (Duh). One can expect utmost care behind each model. You’ll be amazed by the capacity of this mug. Surprisingly, this little commodity can hold 20 oz. worth of water inside. Warm water helps in a big way. It keeps lather ready for use. This much water and lather are more than enough for two or three gentle passes for a casual wet shaver. That’s not the end of it. I found a bump at the bottom. This “Bottom Bump” helps to whip the cream, gel or soap quickly with brushes. As a result, I found rich and creamy froth inside 30 seconds. Just how I like it. There are ridges all along the wall of the cup. These ridges help in thickening the froth we make. Keeping the water and lather warm is a key part of wet shaving. Georgetown Pottery G20 manages to do it thanks to a pewter-capped top. This cap seals the top and doesn’t let any of the steam or heat get away. It won’t keep the water hot forever. But it’ll do just enough for people to have a 20 min. session. The color and the design of G20 are going to blow many of you away, this is for certain. The scuttle mug is heavier than normal bowls; it is sturdy and durable as well. There’s a tiny hole which connects to a 20 oz. reservoir of warm water inside for frothing. Lather itself will be thick and creamy thanks to the bottom bump and ridges on the wall. 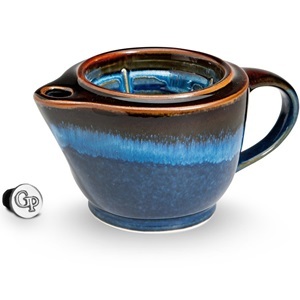 Georgetown Pottery came up with the scuttle mug after consulting a number of wet shavers. Nitpicking this product for negatives is a futile task for me, I’m in love with it. Yeah, it’s a buying guide. No matter how lightly you approach the topic, there are some factors that play a direct hand in quality of these products. I’ll be keeping all the cards on deck and will discuss these factors in substantial detail. Pay attention and you’ll find that I’ve referenced different shaving bowls/mugs/cups made of different materials. A bowl’s properties vary depending on what it is made of. Each material has a different feel to it. Each comes with its own set of benefits and drawbacks too. For example, we have Ceramic products that are great to look at. These products offer you sleek design and good enough heat retention. People can choose from a wide variety of options. However, such readily available commodities break easily. Lather quality isn’t that great. If you want a great product, you’ll have to loosen up your wallets. Then there’s wood. I didn’t get the chance to use one for myself yet. But from what I can gather, these bowls give off a luxurious vibe. Wooden bowls are good heat retainers as well. These are rough on the inside. Thus, these bowls provide rich and creamy froth in quick time. These things have their fair share of drawbacks as well. One key issue is; wood soaks up water over time. You’ll see your bowl warping or get distorted and lose the shape in a few years. The third option is to go plastic. These things are pretty cheap. You won’t find them retaining the scent of your shaving soap, cream, and gel. Plastic doesn’t burn your skin yet it keeps the lather warm. One thing’s for sure, you’ll have plenty of options in terms of size and color. A plastic shaving bowl is durable too. However, it IS cheap no matter which way you look at it. The smooth surface inside won’t get you a good lather. Also, it feels odd when paired up with a good shaving counter and topnotch accessories. If nothing of the above interest you, go for metal-made bowls. You can customize them in various ways to suit your preferences. These are the best shaving bowls when it comes to durability. A metal commodity won’t cut your wallet too deep. Be careful about the size of these things. These can be dented if you are not careful. Also, the surfaces aren’t textured. You might not end up with good lather. Once you are done choosing your type from wood, plastic (I wouldn’t recommend), ceramic, and metal; decide what’s the ideal dimension of your bowl is going to be. The size depends on how often you shave and for how long. Depending on these two factors, you get to choose between a narrow scuttle, a mid-sized cup, and a large-sized bowl. Scuttles are great at keeping the froth warm. Most often than not, they have textured walls and bottoms to conjure up thick lather too (Georgetown Pottery G20). Yet, they give you little room to wiggle the brush itself. Mid-sized cups will be a bit more price-friendly and functional. One thing you get with these cups or shaving mugs is the depth you need to put in your soaps. They hold more lather (obviously) than the scuttles. Also, these things come with a handle to stabilize the commodity when lathering. I, for one, am a luxurious shaver. I prefer room when wiggling the brush around to create foamy froth. Also, as someone who takes time and multiple passes to complete shaving, these shaving bowls are a blessing. These things hold more shaving soap than any other kind. I am seemingly repeating myself every once in a while in this article. I’ve already given you guys subtle hints that texture of a bowl’s inside is important. Polished bowls won’t give people that good of a lather. When choosing your shaving commodity, make sure to inspect the inside part. I found textured surfaces with bumps and ridged walls useful. These textures offer assistance when you are rubbing shaving brushes with the cream, soap or gel. The rough surface and shaving brushes create friction which quickens the froth creation process. Froth or lather is crucial for wet shaving. People do all sorts of voodoo (pun intended) to come up with quality, foam-like soap extract to apply to their faces. Some like it hot and some like it cold. There are two basic choices depending on the froth type. If you want to have a warm froth all the way during four or five passes, buy the best shaving scuttle. For people who don’t mind the lather eventually cooling off, buying a shaving mug or a bowl is enough. Make sure that commodity has thick walls to delay the cooling as much as it can. Price of these products does vary. Smaller stainless-steel shaving bowls will cost you less (into single digits). But they can’t hold a substantial quantity of foam inside. As the size increases, so will the price. Also, if you want to have a mug or scuttle to keep the foam warm, you’ll have to spend a bit more. “More” doesn’t have a number. It can be anything from below 30 dollars to below 50 depending on what perks you want. Sleek products often will cost you ample amount of money. For me, mid-ranged products have the perfect blend of looks and functionality. My optimum range is from $20 to $40 and no more. I could go on rant on this topic page after page and word after word. But I won’t I tried my best to tie all the loose ends together and provide my thoughts on the top shaving bowls that are ravaging the market right now. In all honesty, these are the “Magnificent Seven” when it comes to the spot for best shaving bowl. From here, it depends on how you prefer your shaving routine to go down, which materials go with your taste of furniture, and how quickly you shave. I’m certain that one of these (or all of them, who am I to judge?) will make a perfect addition to your shelves. If I had to pick one, I’d be going for either Schöne (for style) or Georgetown Pottery G20 for the functionality. These two are worth every penny one puts into the purchase and more. 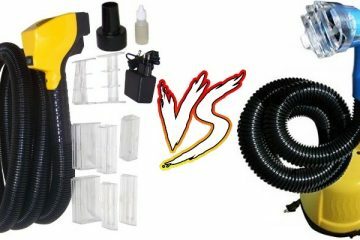 Flowbee Haircutting System Review: Is It Better Than Robocut?